James* and I met at an Italian-themed dinner party when we were in our late 20s and clicked instantly. I’d had a few too many martinis and we chatted for hours about how frustrated we were by our nine-to-five routines and how we dreamt of running our own businesses. Soon after we both took the leap of faith – he started a legal consulting practice and I started running bread-making courses – and in 2014, four years after we met, he proposed. Though I was overjoyed and said yes instantly, there was a tiny niggle. 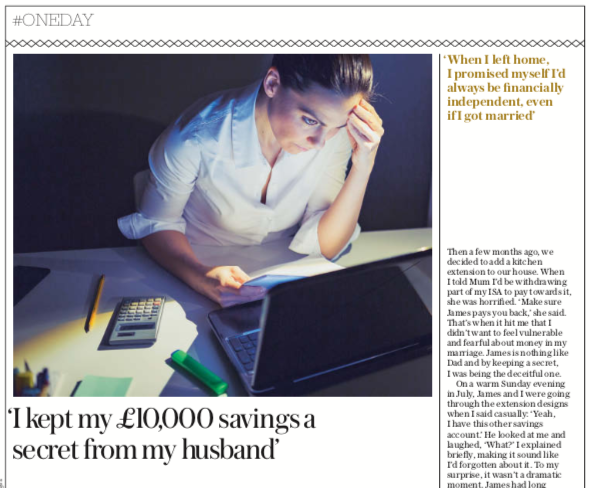 We lived in my flat and shared pretty much everything, but there was something I’d always kept from him: I had a secret savings account containing £10,000. As the wedding approached I thought about telling him, but the big day came and went, and as the years rolled on, I told myself it was too late. I’d started saving the money at university and though I adored James – and our businesses were going well – having the money there made me feel safer and independent. This might sound strange, coming from someone who is happily married, but looking back it was all because of my childhood. Growing up, my parents argued constantly. Though well off, they were incredibly frugal and as I got older I noticed that Dad kept a tight hold over the family finances, using them to control Mum. Once she told me that Dad had transferred all the money from their joint account into his sole account, and also that he had donated thousands to charities he supported without ever speaking to her about it first. But when I was at university, and Mum paid for my dental fees without telling him, he retaliated by cancelling her credit card. I was furious but never confronted him – it would have meant betraying Mum’s confidence – and despite all this, they’re still together. However, I’ve still not forgiven him and when I left home I vowed to never let anyone control me. I promised myself I’d always be financially independent, even if I got married. However, the longer I kept my savings a secret, the more duplicitous I felt – especially as James didn’t suspect anything. Then a few months ago, we decided to add a kitchen extension to our house. When I told Mum I’d be withdrawing part of my ISA to pay towards it, she was horrified. ‘Make sure James pays you back,’ she said. That’s when it hit me that I didn’t want to feel vulnerable and fearful about money in my marriage. James is nothing like Dad and by keeping a secret, I was being the deceitful one. On a warm Sunday evening in July, James and I were going through the extension designs when I said casually: ‘Yeah, I have this other savings account.’ He looked at me and laughed, ‘What?’ I explained briefly, making it sound like I’d forgotten about it. To my surprise, it wasn’t a dramatic moment. James had long known about my dad and he understood how hard my childhood had been, so maybe that’s why he didn’t probe. As for Mum, I haven’t told her that James knows about my secret account because it would worry her, but I know I did the right thing. Telling him was frightening – his reaction could have been completely different, but it showed me just how strong we are together. The builders are arriving soon to start the extension. I’ve withdrawn the money from my ISA savings as planned and I’m happy with that. I’m excited about our future; I can’t wait to finish the house and we’re hoping to have children soon. Plus, it’s nice to know we have a nest egg that we can enjoy together one day.